Memorial day is coming and this means that summer is really close. But before you rush to prepare grills and meat, some serious work must be done. Memorial day is one of those times when ecommerce marketers can definitely take advantage of to increase sales. According to Forbes, nearly one-third of all Americans plan to shop on Memorial Day weekend, and knowing the fact that online sales are steadily growing every year, it’s pretty obvious that ecommerce businesses should prepare accordingly. But before you begin on these Memorial Day subject lines, be sure to check our proven techniques on creating the best email subject lines. Although the content is key to a successful email campaign and increased sales, subject lines are the 1st step towards it. If they are uninspiring, plain and boring, no one is going to click the email in the first place. 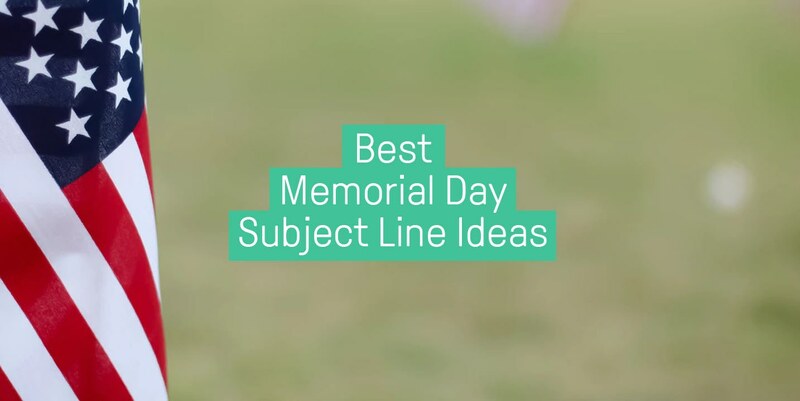 In this blog post, we’ll share our top picks for Memorial Day subject lines that will increase your open rate and, therefore, take subscribers towards a purchase. We searched through more than 9,000 of our bigger brands’ 2017-2018 Memorial Day email campaigns to find out what the best, highest-performing subject lines are. With Memorial Day subject lines, we see that some merchants are not willing to put a discount percentage or other obvious benefits, even though they actually worked. Looking at the top 2 subject lines, a clear discount was definitely an important factor that increased the open rate. Also, an interesting tactic was chosen in the #5 subject line. Even if the email is not opened, there’s a chance that a recipient will the discount code in the subject line. When you’re creating Memorial Day subject lines, don’t hesitate to try out many different things and see what works. Not sure which subject line to pick? How about two at the same time? Omnisend allows online marketers send emails with A/B testing with two different subject lines. A/B testing allows you to send out two subject lines or two different sender’s names to a small percentage of your recipients so you can see which one worked best. The one with the highest open rate (or click rate) then gets sent automatically to the rest of your recipients. [Your brand name] | Memorial Day Sale Starts Now! Memorial Day Sale: Go Go Go! yay for long weekends + big savings! Flash Sale: 20% Off Patriotic Fanny Packs! Memorial Day Weekend – 25% Off Hundreds of Items! Gigantic Memorial Day Sale! + In-Store Only Clearance Deals! Memorial Day Sale: Extra 15% off + Free Shipping! FREE U.S. SHIPPING…all Memorial Weekend!! Ends Tonight: 40-60% off EVERYTHING! LAST CALL for Memorial Day Deals! BIG Memorial Day Sale- 30% OFF ENDS MONDAY! Happy Memorial Day! LAST CHANCE Sale ends TODAY! Final Hours on the Memorial Day Sale! Last Chance to Kick your Summer off with Memorial Day Savings! Hurry – Memorial Day Sale and Free Shipping End Today! Chill, Grill & SHOP! 50% Off ALL Dresses & Rompers! STEP OUT FLY AND SAVE $$$ FOR MEMORIAL! Memorial Day Event at [your business name]! Cool, you made it to the end! Thanks for checking out this list of Memorial Day subject lines that you can use as an inspiration to increase email open rate. If you’re looking for more ideas on how to make those subject lines more compelling, read our comprehensive guide on the best spring lines ideas. Even though the other spring holidays have passed, the blog post still contains tons of valuable tips, ideas, and inspiration.